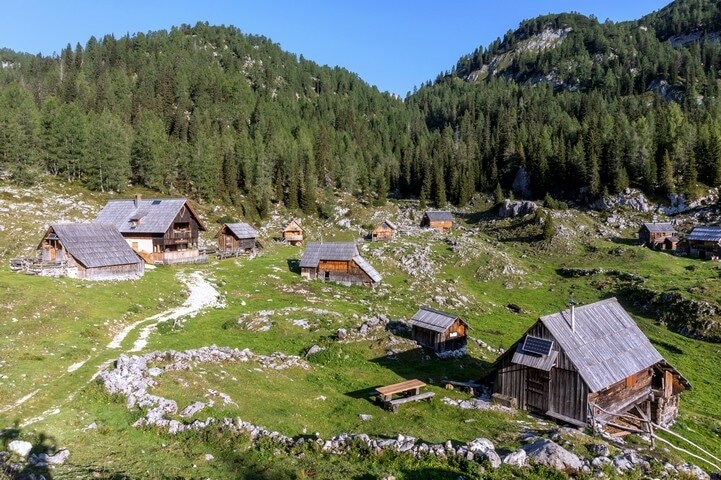 Walking in the Valley of the Seven Lakes is probably the most popular area in the Julian Alps. This is the crème de la crème. 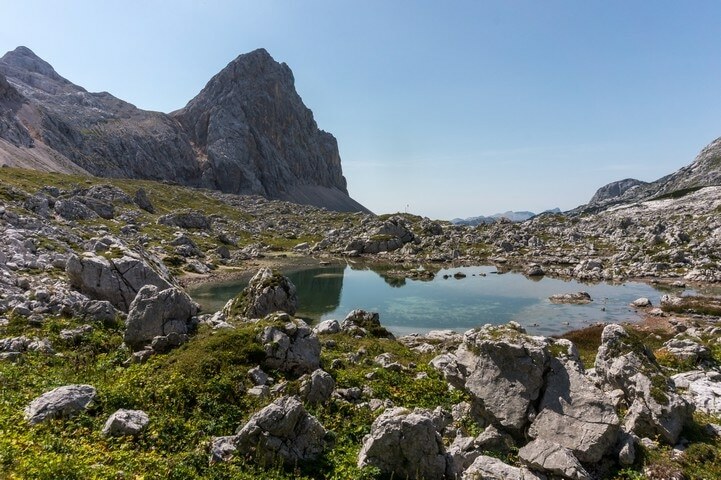 This hike offers you everything: picturesque pastures, hilly landscapes, sharp rock ridges, distant panoramic views, shiny lakes, and mountain huts. But, it comes at a price: a full day of hiking! This is a big day out, but very rewarding. From the 633, driving towards Bohinj lake, enter Stara Fužina. Turn left when the main road crosses the bridge. Follow the road until you reach a parking area, then drive up for ~6.0km. Turn right on the gravel road to Planina Blato/Planina pri jezeru. Drive 1.0km and park. Go back from the parking lot on the road you drove in on and look for the broad, steep cart track going up on your right (at the Triglav National Park wooden map board). Follow the cart track up and, in around ten minutes, keep to the left (the path to the right goes to Planina v Lazu). A few steps up the path and you’ll connect with the path from Vogar pasture. 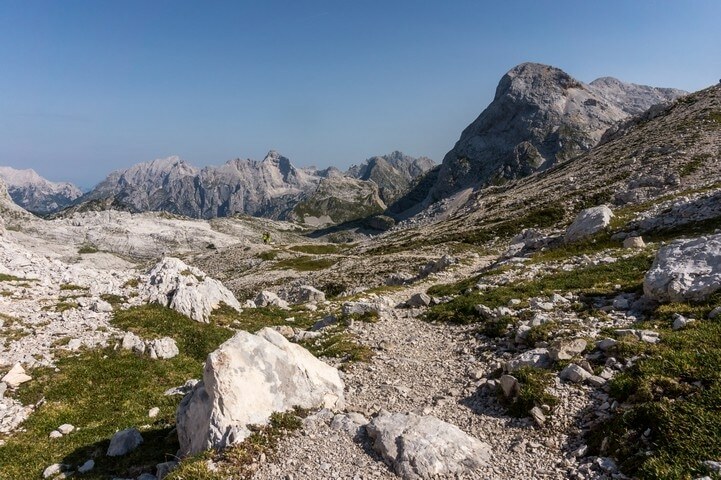 Eventually the rocky cart-track will take you to the Planina pri Jezeru hut. Take note of the beautiful lake behind the hut. From the hut, walk down a little bit to the west to reach a signed junction. Go straight ahead on the wide path in the direction of Planina Dedno polje (The path to the left goes to Planina Viševnik and Pršivec). The path climbs up through a scarce spruce forest. In about 40 minutes you will get to the Dedno polje pasture. At the water trough drop down to the right in the direction of Preval Hribarice, Prehodavci and Dolič. Walk between the old shepherd´s houses to the other side of the pasture. At the less noticeable crossroad proceed straight up the trail (the right path goes to Planina v Lazu). The path climbs up through the larch and spruce forest. In about 30 minutes from Dedno polje, the trail will level out, and a nice view of the surrounding peaks opens up. Further ahead, the path gains elevation quickly, climbing up the slopes of Slatna and Prvi Vogel. Leaving the tree line and turning slightly to the right we find ourselves in the Za Kopico valley. 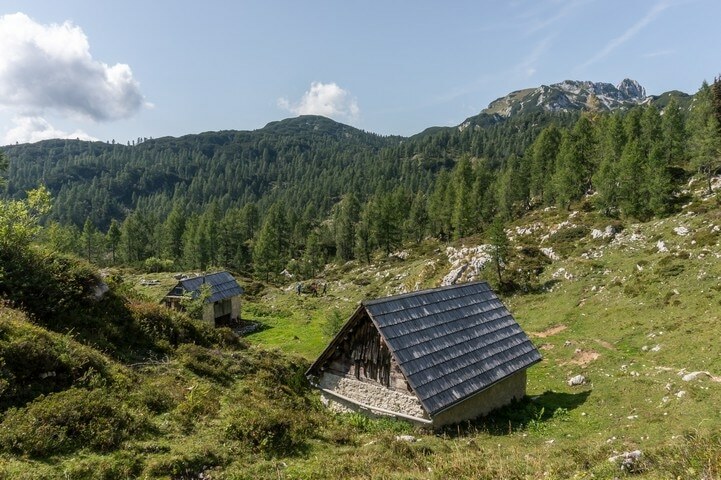 Be sure to look back and enjoy the stunning view across the valley to the lower Bohinj mountains. Follow the path to the saddle Vrata, where the view opens up to the north. You should spot the high peaks of Prisank, Razor and Škrlatica on the horizon. Continue north and descend. 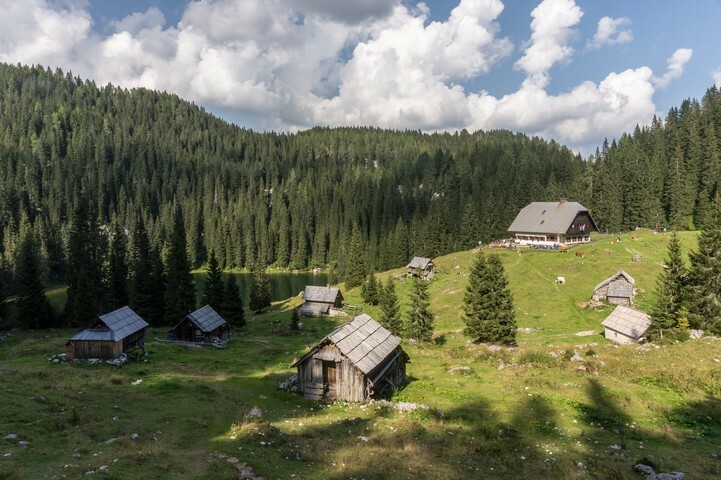 Soon you will spot the Zasavska hut at Prehodavci on the north edge of the valley. Then, the path curves to the right and starts to climb back up again towards the walls of Vršaki. About fifteen minutes later, you will get to the intersection where the path from Hribarice joins from the right. Turn left at the large stone and follow it down. Continue to the right and pass the Rjavo jezero lake. After a short climb you will get to the Zasavska hut at Prehodavci. This is a great place to have a break. The hut offers you some local food and tea. 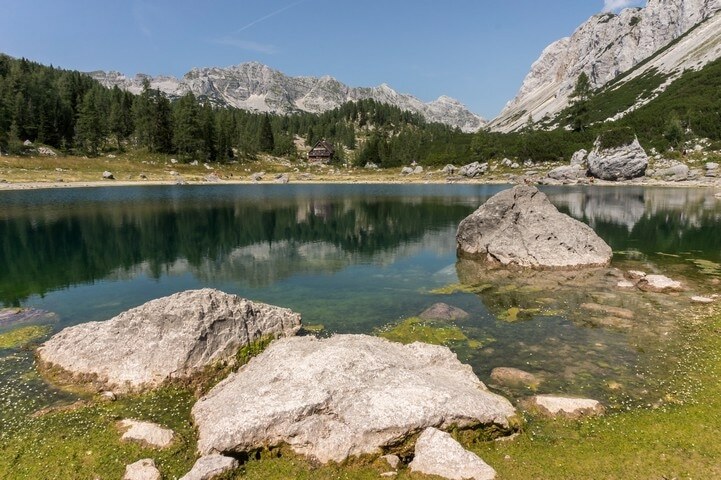 Make sure to savour the breathtaking views to the western Julian Alps peaks. 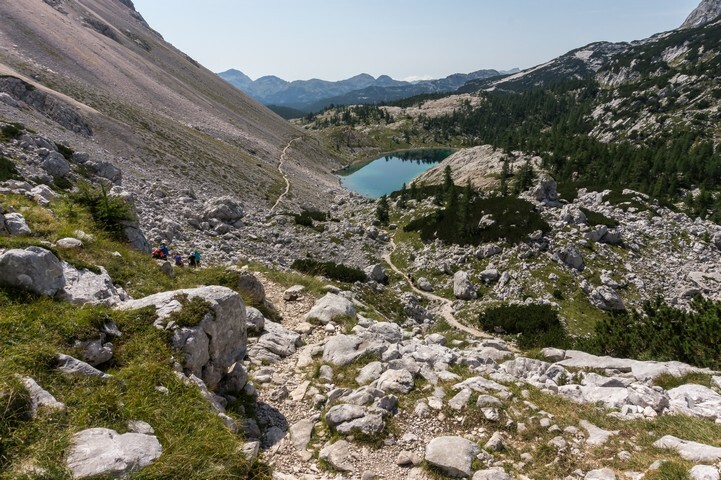 Walk back down from the hut to the crossroads and point yourself south – in the direction of Koča pri Triglavskih jezerih. Pass the winter bivouac on the gravel foot path, cross a short plain and descend to the Green lake. With the Green lake on your right, continue on the trail down the valley of the seven lakes. As the trail starts to descend more rapidly, you will spot the largest of the seven lakes, Jezero v Ledvicah (Kidney lake). Continue on the path to the south. 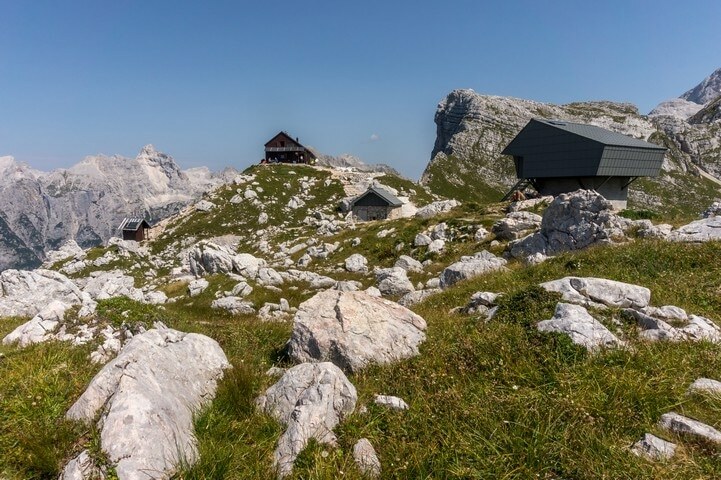 You will reach the hut at the Triglav lakes. You can buy some food and drinks here too! From the hut continue to the south with the Dvojno jezero (Double lake) on your right (you can also do a circuit of the lakes if you want). Soon the path starts to climb up through the forest. A few minutes later, you will dip down and find yourself at a crossroad. Take the path to the left in the direction of Planina Ovčarija (the path to the right goes to Hotel Zlatorog). The trail descends through the trees before opening up onto some grassy slopes. As we cross the slopes, the path starts to climb up again. Eventually, it flattens out at a beautiful viewpoint. Look to the west and admire the views of the vast Komna plateau. 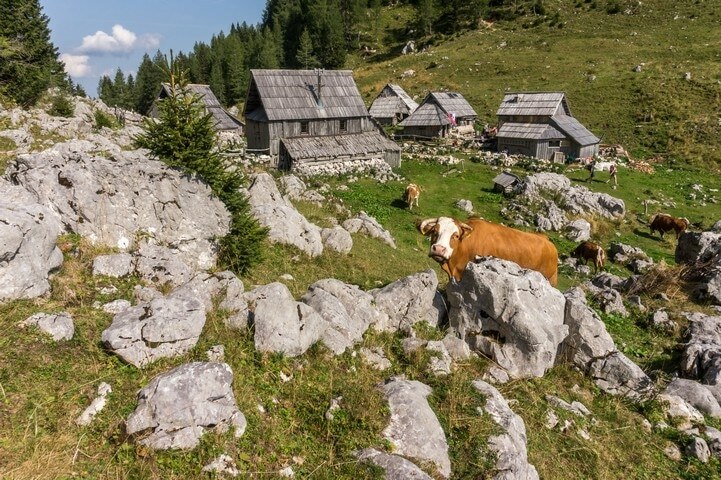 Continue on the pleasant path and you will arrive at the Ovčarija pasture. Find the red signs and continue straight in the direction of Planina Viševnik, Pršivec and Planina pri Jezeru. There is another intersection just 50m ahead where you’ll turn right: heading to the Planina Viševnik and Pršivec. This is a smaller and not much used trail. In a few minutes you will pass a few old shepherd´s cottages, and the path will start to climb until you will reach a saddle. Follow the path east and, after a short descent, you will find yourself in a small forest valley. As the path starts to climb again there will be a less noticeable crossroad where you should keep right (left is an unmarked path going to Dedno polje). In approximately ten minutes you will rapidly descend, going southeast. Watch your step on the roots and rocks. Coming from the forest you will get to the Viševnik pasture. In the middle of a small shepherd´s village look for the Bregar refuge (there should be a waving Slovenian flag attached to it). Sit down for a moment and have a refreshing drink. Leaving the pasture continue northeast in direction of Planina Blato and Planina pri Jezeru. Take the right path at the intersection just 50m from the refuge. You’ll walk through the woods for less than 30 minutes. Eventually, you will get back to the Planina pri Jezeru hut. From here return the same way to the parking space near Planina Blato. You will have to pay a fee to access the mountain road (10€). When at Prehodavci, turn to the northeast. Just between the two nearest peaks, you can spot the top of Mount Triglav. Using binoculars or camera’s zoom you should be able to see the Aljaž tower on top! It is essential to start this long hike early in the morning. If you have the time, this is a wonderful walk and you can extend it to two days by sleeping overnight at one of the huts. In the season, book a bed in advance. Tired and hungry from all day hiking, you should stop in Stara Fužina village and check what the local inns offer for dinner. Staying in Bohinj area you should check the Mostnica gorge near Stara Fužina village. Park your car on the gravel parking at the end of the village, where the mountain road to Blato pasture begins. There is a foot path to the north. You will reach the gorge in a few minutes.